Fluid biomarkers improve the diagnostic accuracy in dementia and provide an objective measure potentially useful as a therapeutic response in clinical trials. The role of fluid biomarkers in patient care is a rapidly evolving field. Here, we provide a review and recommendations regarding the use of fluid biomarkers in clinical practice as discussed at the Fourth Canadian Consensus Conference on the Diagnosis and Treatment of Dementia (CCCDTD4) convened in Montreal, 4 to 5 May 2012. At present, there is no consensus regarding the optimal methodology for conducting quantification of plasma amyloid-beta (Aβ) peptides. In addition, since there is insufficient evidence supporting clinical applications for plasma Aβ-peptide measures, the CCCDTD4 does not recommended plasma biomarkers either for primary care or for specialists. Evidence for CSF Aβ1-42, total tau and phosphorylated tau in the diagnosis of Alzheimer pathology is much stronger, and can be considered at the tertiary care level for selected cases to improve diagnostic certainty, particularly in those cases presenting atypical clinical features. Examination of biological fluids provides quantitative information regarding biosynthesis, concentration and kinetics of biomarkers of interest to dementias as well as their respective metabolites. Today high-throughput analytical platforms are available for detailed analysis of fluid biomarkers, and at some point in the near future advanced proteomics techniques will possibly reveal signatures for all neurodegenerative diseases. These technological advances ultimately bring the promise of preclinical diagnosis of dementias using fluid biomarkers. Significant developments have been obtained with quantification of cerebrospinal fluid (CSF) and plasma concentrations of amyloid beta (Aβ1-42), total tau (t-tau) and phosphorylated tau (p-tau) in the 181-threonine position [1, 2]. However, despite favorable results obtained from large cohorts of dementia patients, translation of these technological advances into diagnostic methods is limited by important factors such as reliability (that is, variability across laboratories) and accuracy (that is, inter-individual biological variability). Different from previous reviews on this topic, the present paper aims to summarize the fluid biomarker literature and to provide recommendations to physicians regarding the clinical utility of these novel techniques in Canada. A biomarker is defined as a 'characteristic that is objectively measured and evaluated as an indicator of normal biology, pathological process, or pharmacologic responses to a therapeutic intervention' . Specifically, diagnostic or core biomarkers express measures of the underlying molecular pathology of a disease. In Alzheimer's disease (AD), biomarkers are generally classified as biomarkers of amyloid accumulation and biomarkers of neurodegeneration . Core AD biomarkers reflect amyloid pathology (Aβ1-40/Aβ1-42 extracellular accumulation) or intracellular deposit of neurofibrillary tangles (hyperphosphorylated tau inclusions) [3, 5]. As such, biomarkers serve to identify in living individuals a variety of neuropathological features previously detected only by the analysis of specimens from biopsy or necropsy [6–8]. The availability of biomarkers for quantifying in vivo AD pathology (AD-P) has propelled advances in the understanding of AD as a dynamic clinicopathological entity. In contrast with the cross-sectional nature of neuropathology, biomarker assessments allow for longitudinal observations necessary to describe the temporal progression of neuropathology in neurodegenerative diseases . Indeed, the value of imaging or fluid biomarkers for supporting the diagnosis of AD in living individuals has been acknowledged in the 2011 National Institute on Aging-Alzheimer's Association criteria . In the past two decades, research in AD has elaborated a construct called the amyloid cascade hypothesis, which posits that a defect in Aβ-peptide metabolism, a major chemical constituent of amyloid plaques, triggers a downstream cascade of neurodegenerative events leading to dementia [10–12]. This amyloidocentric disease model supports the basis for the classification of biomarkers as indicators of amyloid deposition or evidence of neurodegeneration (see Table 1). Aβ1-42, amyloid-beta; CSF, cerebrospinal fluid; DAT, DopAmine Transporter; FDG, fluorodeoxyglucose; FLAIR, fluid attenuated inversion recovery; FTD, frontotemporal dementia; HMPAO/ECD, (99mTc) exametazime, (99mTc) -ethylcysteinate dimer; LBD, Lewy body dementia; MRI, magnetic resonance imaging; PET, positron emission tomography; SPECT, Single-photon emission computed tomography. aSee associated Canadian Consensus Conference on Diagnosis and Treatment of Dementia publications on biomarkers. Biomarkers of amyloid accumulation refer to indices of brain amyloid deposition obtained using either positron emission tomography (PET) or analysis of CSF or plasma. While PET and amyloid agents (Table 1) quantify abnormal accumulation of Aβ peptides as amyloid plaques, declines in CSF concentrations provide an index of Aβ1-42 retention in the brain. These methods constitute powerful means for in vivo detection of pathological Aβ1-42 aggregation and deposition in the brain tissue [2, 13]. Mega-aggregates of Aβ peptide form amyloid plaques in AD. Aβ1-40/Aβ1-42 peptides result from the proteolysis of an integral membrane protein called amyloid precursor protein (APP). In the membrane, APP is differentially cleaved via nonamyloidogenic and amyloidogenic proteolytic pathways (Figures 1 and 2). In the nonamyloidogenic pathway, APP is sequentially cleaved by an alpha-secretase (a disintegrin and metalloprotease domain 10) and a gamma-secretase, precluding formation of the amyloidogenic peptides and leading to the release of soluble peptides (APPα) into the extracellular space. In contrast, the amyloidogenic pathway, which refers to the sequential APP proteolysis (cleavage) by the enzymes beta-secretase (beta-site APP cleaving enzyme) and gamma-secretase, results in secretion of insoluble (Aβ1-40/Aβ1-42) peptides into the extracellular space. Both Aβ1-40 and Aβ1-42 are hydrophobic and tend to form aggregates in aqueous environments. Once in the extracellular space, Aβ1-42 molecules undergo a massive aggregation process, which generates an amyloid plaque. Importantly, neurotoxic soluble Aβ1-42 aggregates (oligomers) are transiently formed during the process of plaque formation . Possibly, oligomeric forms of Aβ are increased in the CSF of AD patients [15–18]. The toxicity of Aβ1-42 oligomers has been extensively demonstrated by numerous studies (see ). Biochemical pathways associated with core biomarkers for Alzheimer's disease. Biochemical pathways associated with the core biomarkers for Alzheimer's disease (AD) in the intracellular, membrane, extracellular, cerebrospinal fluid (CSF) and plasma compartments. Left: intracellular production of the amyloid precursor protein (APP), which is an integral part of the plasma membrane. APP is metabolized by a nonamyloidogenic (blue arrows) and an amyloidogenic pathway (red arrows). Right (neurodegeneration): an increased proportion of phosphorylated tau protein over nonphosphorylated tau protein at the threonine located at position 181 (p-tau-181) and position 231 (p-tau-231). 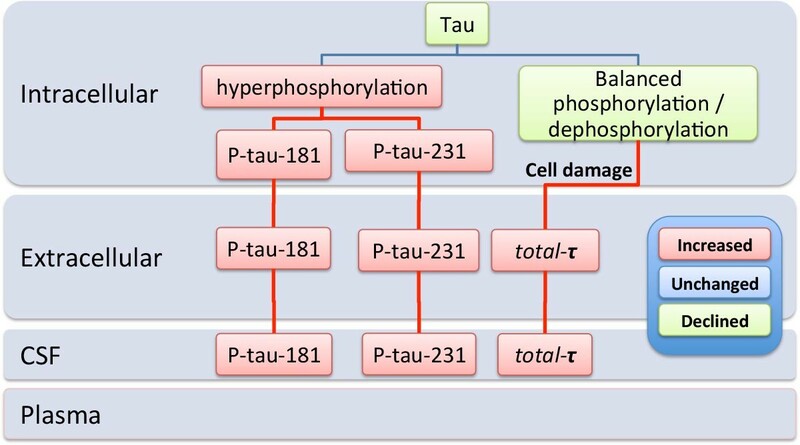 While increased p-tau-181 and p-tau-231 in the CSF indicates hyperphosphorylation, total tau conveys cell death. Aβ, amyloid-beta; ADAM, a disintegrin and metalloproteinase; BACE, beta-site APP cleaving enzyme; sAPP, soluble amyloid precursor protein. 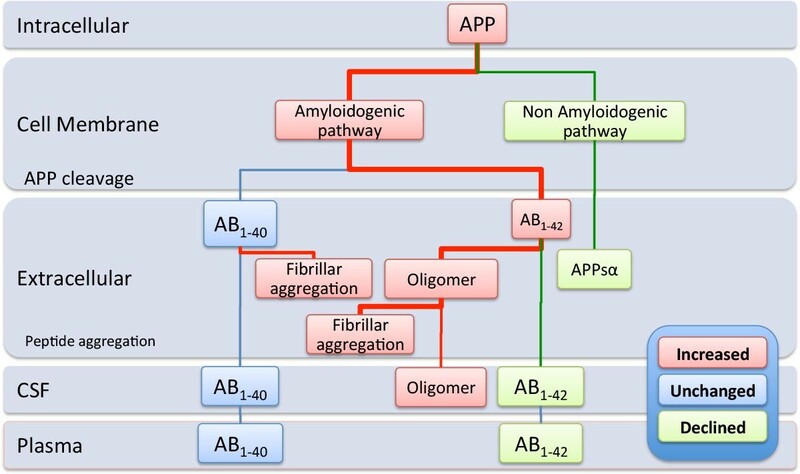 Amyloid precursor protein metabolism and biomarker of amyloid pathology. Schematic representation of amyloid precursor protein (APP) metabolism and biomarker of amyloid pathology in various of the intracellular, membrane, extracellular, cerebrospinal fluid (CSF) and plasma compartments. Color pallet indicates processes that have increased, declined or remained unchanged in Alzheimer's disease (AD). Note that in AD higher amyloid-beta (Aβ1-42) retention in the extracellular compartment (brain tissue) due to peptide aggregation leads to declines of Aβ1-42 in the CSF. In the plasma, it is debatable whether declines are present in individuals with AD. From the biomarker perspective, while amyloid PET agents detect increases of brain Aβ-peptide amyloidosis, CSF measures detect declines in Aβ1-42 concentrations. In fact, Aβ1-42 CSF concentrations and amyloid load detected by [11C]Pittsburgh compound B PET are correlated in an exponential fashion [19, 20]. Low Aβ1-42 CSF concentrations in AD and mild cognitive impairment (MCI) are believed to be due to progressive brain retention of Aβ-peptide moieties in the form of amyloid plaques. Although several plasma biomarkers - including plasma concentration of clusterin, C-reactive protein and acetylcholinesterase - have been tested in the context of dementia, core AD plasma biomarkers constitute a less invasive alternative for lumbar punctures [21, 22]. Plasma Aβ1-42 levels or the Aβ1-42/Aβ1-40 ratio have been studied in AD and MCI as well as in at-risk populations using enzyme-linked immunosorbent assays and multiplex platforms [23, 24]. In general, these results show elevated Aβ1-42 or Aβ1-42/Aβ1-40 ratio plasma concentrations in asymptomatic carriers of familial AD mutations (APP, PS1, and PS2) as well as patients with Down syndrome [25, 26]. In cases of sporadic AD, there is evidence suggesting that low plasma levels of Aβ1-42 or Aβ1-42/Aβ1-40 ratios characterize individuals with AD [24, 27] (Figure 2). However, there is no correlation between Aβ1-42 or Aβ1-40 plasma and CSF . Overall, these results need to be replicated due to disagreement between studies, although a recent meta-analysis of plasma core biomarkers in AD indicates that Aβ1-42/Aβ1-40 predicts progression to dementia . Methodological limitations in terms of sampling and analysis require further validation and standardization (for further details see [29, 30]). At the present state of development, biomarkers are not yet suitable for clinical applications. According to the amyloid cascade hypothesis, a decline in brain function revealed by biomarkers of neurodegeneration occurs as a result of amyloid toxicity, although the mechanisms linking amyloid pathology and neurodegeneration remain elusive . Currently, [18F] fluorodeoxyglucose PET, magnetic resonance imaging (MRI) volumetry, and CSF t-tau or p-tau are the most relevant biomarkers of neurodegeneration, providing information regarding neurodegenerative processes present in patients with AD-P .
t-tau and p-tau constitute the classic AD CSF biomarkers for neurodegeneration (Figure 3). The tau protein is a constituent of neuronal microtubules, which are cell structures responsible for the motility of proteins and organelles within the neuron . The functional expression of microtubules is modulated via phosphorylation of numerous serine and threonine residues (phosphorylation sites) present in the tau protein . In AD, abnormal tau hyperphosphorylation is observed within neurons as neurofibrillary tangles or dystrophic neurites present in neuritic plaques  (Figures 1 and 2). In MCI, concentrations of t-tau and p-tau in the 181-threonine position are elevated by 30-40%, while elevations up to 40-50% are seen in AD patients [33, 34]. Synaptic injury or cellular death contributes to the leakage of t-tau and p-tau to the extracellular space. In fact, the CSF t-tau concentration is also increased in patients with encephalitis, trauma and stroke [35–37]. The CSF tau concentration is useful for distinguishing AD patients from control subjects as well as from non-AD forms of dementia, although overlap at the level of pathology often exists [38, 39]. Biomarkers of tau pathology. Schematic representation of biomarkers of tau pathology in in the intracellular, membrane, extracellular, cerebrospinal fluid (CSF) and plasma compartments. Color pallet indicates processes that have increased, declined or remained unchanged in Alzheimer's disease (AD). It has been proposed that the leakage of tau into the extracellular and CSF space is secondary to brain damage. Note in AD the increased concentrations of phosphorylated tau in all compartments. p-tau-181, phosphorylated tau protein at the threonine located at position 181; p-tau-231, phosphorylated tau protein at the threonine located at position 231. Despite numerous threonine and serine phosphorylation sites present in tau protein, AD is best characterized by hyperphosphorylation at amino acid positions 181 or 231 . p-tau in the 181-threonine position or in the 231-threonine position is specific for AD-P .
Cross-sectional and longitudinal biomarker data provided the empirical basis for an AD model called the dynamic biomarker of AD pathological cascade. Proposed by Jack and collaborators, this model is widely accepted by the research community as a model of biomarker progression from the asymptomatic to dementia phases of AD . The dynamic biomarker of AD pathological cascade hypothesis incorporates the entire clinical spectrum of AD comprising preclinical, MCI due to AD, and dementia stages as well as their specific biomarker signatures. Moreover, biomarker abnormalities are assumed to act as a surrogate for progressive neuropathological changes and follow a nonlinear progression, as shown in Figure 4. Similar to the amyloid cascade hypothesis, the dynamic biomarker of AD pathological cascade model assumes amyloid accumulation as an early event leading to a cascade of successive neurodegenerative processes (that is, tau pathology, synaptic depletion and cell loss) resulting in dementia . 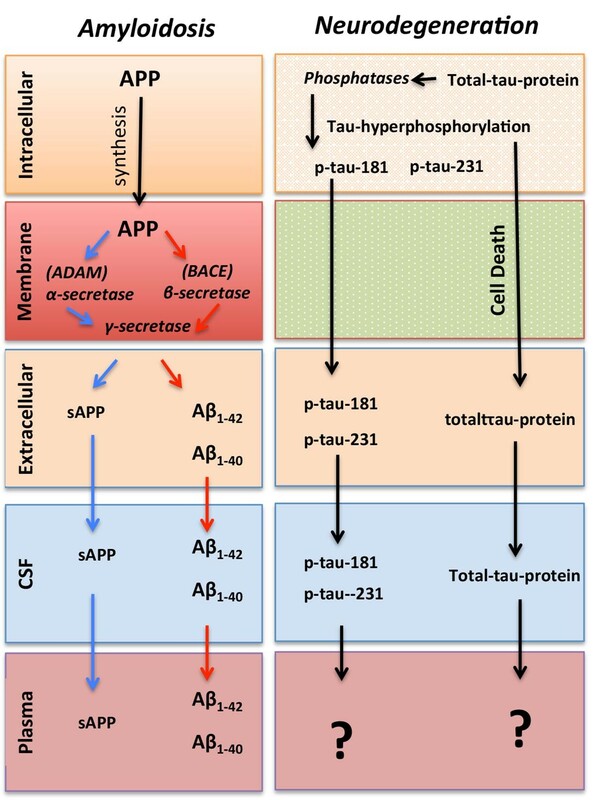 The dynamic biomarker of AD pathological cascade model predicts decline of Aβ1-42 followed by sequential tissue functional abnormalities (hypometabolism) and release of tau and p-tau in the CSF, and brain atrophy detectable by MRI. This model also proposes that memory and functional declines occur as a function of neurodegeneration . Dynamic biomarkers of Alzheimer's disease pathological cascade. The dynamic biomarkers of Alzheimer's disease pathological cascade, as proposed by Jack and collaborators. This model predicts a preclinical and mild cognitive impairment (MCI) stage of Alzheimer's disease (AD) characterized by predominance of amyloid pathology and a dementia phase characterized by amyloid pathology, neurodegenerative changes and subclinical cognitive impairment. Adapted from . A PubMed-based literature systematic review focusing on fluid biomarker peer-reviewed papers published since 2000 was drafted and subsequently reformatted in order to fit approximately 100 references and 4,000 words. Evidence-based fluid biomarker recommendations were discussed in the context of Canadian clinical practice during the Fourth Canadian Consensus Conference on the Diagnosis and Treatment of Dementia (CCCDTD4) [41, 42]. CCCDTD4 recommendations were based on panel consensus following GRADE working group recommendations . The methodology for grading evidences was based on those detailed elsewhere [41, 42]. Fluid biomarker concentrations are typically low and vulnerable to manipulation and sampling. Considerable variability in absolute concentrations and cutoff values of AD biomarkers has been found between different centers using the same assay . In principle, the lumbar puncture procedure should follow a standard operating procedure to minimize the chances of false positive results. The best practices for CSF sampling and analysis remain a work in progress. Standard operating procedures for the xMAP multiplex platform (Luminex, Austin, TX, USA) have recently shown an intralaboratory variation in the order of 5% and inter-laboratory variation between 10 and 20% . The Alzheimer's Biomarkers Standardization Initiative recommendations for CSF biomarker are summarized in Table 2. These techniques are available for clinicians in commercial and research settings in the USA and Europe. Samples may be sent by regular post (transport 5 days). Storage at -20°C for less than 2 months. Note: no evidence of any effect for up to 2 years at -80°C. Summary of Alzheimer's Biomarkers Standardization Initiative recommendations for pre-analytical and analytical aspects for Alzheimer's disease biomarker testing in cerebrospinal fluid. Adapted from . CSF, cerebrospinal fluid; LP, lumbar puncture; MRI, magnetic resonance imaging. Much research has occurred over the past decade in terms of the development and validation of CSF biomarkers for the diagnosis of AD and related dementias. CSF is considered a good source of biomarkers for neurodegenerative diseases since pathological brain changes are expected to be reflected in the CSF owing to its constant contact with cerebral tissue . The most comprehensively studied CSF biomarker in AD is the measurement of Aβ1-42 since it is the main component of the amyloid plaques seen in AD. The Aβ-peptide metabolism in CSF has recently been examined in a study using isotope labeling coupled with mass spectrometry analysis . The average fractional synthesis rate of Aβ in CSF was calculated as 7.6% while the fractional clearance rate was 8.3%, implying that production and clearance rates were not significantly different in healthy adults . The utility of biomarkers in the diagnosis of AD and differentiation from other dementias have been reviewed extensively . AD patients' CSF typically exhibits low Aβ1-42 concentrations and high levels of t-tau and p-tau in the 181-threonine position. This characteristic pattern is regarded as the signature profile of AD in CSF . Amalgamation of data from the Alzheimer Disease Neuroimaging Initiative studies generated a model for the temporal ordering of AD biomarkers, which suggests that Aβ amyloid biomarkers (such as CSF Aβ1-42 or PET amyloid imaging) are the first to become abnormal, followed by changes in neurodegenerative biomarkers (CSF t-tau, p-tau, [18F]fluorodeoxyglucose PET, and structural MRI) with the onset of clinical symptoms [49, 50]. These findings have been confirmed in a number of cross-sectional studies and prospective cohorts [39, 51, 52], including several with pathological confirmation of the diagnosis . When the diagnosis of dementia was ambiguous on the basis of clinical presentation alone, CSF biomarkers improved diagnostic accuracy, and correlated with autopsy confirmation in up to 82% of cases . In another study applying CSF biomarkers in a specialized dementia clinic, knowledge of CSF biomarker profiles changed the diagnosis in 10% of the cases, and confidence in the diagnosis increased for one-third of the patients . Using a ratio of either p-tau/Aβ1-42, or t-tau/Aβ1-42 in differentiating AD from other dementias, the sensitivity was reported to be up to 92%, and specificity 86%, with an overall accuracy of 90% for the presence of pathologic neuritic plaque in the brain . Accuracy was particularly high using this combination of CSF biomarkers in differentiating AD from frontotemporal dementia (FTD), progressive supranuclear palsy, Parkinson's disease with dementia (PDD) and corticobasal degeneration, but not as clear for dementia with Lewy bodies (DLB) and vascular dementia (VaD), possibly because of the propensity for mixed-pathology in DLB and VaD (see below). Patients with Creutzfeldt-Jakob disease demonstrated extremely high CSF t-tau with relatively normal levels of p-tau and Aβ1-42 . An important utility of CSF biomarkers is to predict the likelihood of conversion from MCI to AD dementia. A number of studies support the notion that the CSF signature profile of AD - comprising low Aβ1-42 and high t-tau or p-tau - has good diagnostic accuracy in terms of distinguishing between normal ageing and AD (>85%) and a positive predictive value (>90%) in terms of predicting conversion to dementia in patients with MCI . Large-scale longitudinal studies of MCI cohorts consistently demonstrate that the presence of this AD signature in CSF has a good diagnostic accuracy (>80%) in discriminating patients with MCI who progress to AD (MCI converters) from those who remain cognitively stable (MCI-stable patients) and healthy controls , as well as those MCI patients who progress to non-AD dementias . These findings have been replicated by different research groups worldwide [51, 59], and further reinforced by meta-analyses of different datasets . The converging evidence thus suggests that the presence of this AD signature in the CSF is a strong predictor of dementia outcome due to AD-P, with an increased odds ratio of up to 20 . MCI patients who convert to AD generally have a CSF biomarker pattern indistinguishable from that found in patients with dementia of the AD type. CSF t-tau and p-tau are robust predictors of AD outcome, and are also associated with a more rapid progression from MCI to AD . These findings can be applied to enrich clinical trials via recruitment of MCI subjects who are most likely to progress to clinical AD . While the intention of CSF biomarkers is to diagnose patients with dementia in the prodromal phase and to predict progression in patients with mild symptoms, it has been shown in different cohorts that the characteristic CSF profile of AD can be seen in up to one- third of healthy older individuals [64, 65]. Several longitudinal studies have shown that lower CSF Aβ1-42 and higher t-tau or p-tau levels, even in healthy subjects at baseline, are correlated with future decline in cognitive functions  and faster progression of brain atrophy , suggesting that the CSF changes are consistent with the presence of significant AD-P at baseline . In another study, high CSF levels of t-tau or p-tau was correlated with more severe impairment in memory, mental speed, and executive functioning, which is not explained by disease severity, implying that high p-tau or t-tau may reflect a more aggressive disease course . In comparison with structural MRI, CSF appears to perform less well in detecting changes over time. While both whole-brain atrophy rate as measured by MRI and CSF levels of Aβ1-42, t-tau, and p-tau all provide complementary information in patients with MCI and AD , baseline MRI and fluorodeoxyglucose-PET measures were more responsive to clinical changes than CSF measures in MCI subjects [71–73]. Additionally, structural MRI change was a better predictor of subsequent cognitive/functional change than CSF biomarkers. While MRI and CSF provide complimentary predictive information about the time to conversion from amnestic MCI to AD - with the combination of the two measures resulting in increased predicted power relative to either source alone - it was found that MRI was a better predictor of future clinical/functional decline than the CSF biomarkers tested . Furthermore, when Aβ1-42 and t-tau are used together, p-tau does not appear to have additional value for the purpose of predicting progression from MCI to AD, although p-tau appears to be more specific to AD pathology and t-tau can be elevated in other neurodegenerative conditions . However, a more recent study found that p-tau decreases at a rate of 2.2 pg/ml/year and correlates better with cognitive functioning than either Aβ1-42 or t-tau, possibly reflecting neuronal loss specific to AD . In addition to Aβ1-42, t-tau and p-tau, additional CSF biomarkers have been proposed, although they have yet to be widely replicated. For example, CSF epithelium-derived factor and haptoglobin are measures of oxidative damage, and may help with differentiating AD from other forms of dementia . Sphingomyelin, a class of phospholipids involved in neurodegenerative processes, is significantly elevated in AD compared with controls, with potential utility as an AD biomarker in terms of studying lipid metabolism in the brain. Similarly, lipoprotein receptor (LR11) has been implicated in the pathogenesis of AD, with levels significantly increased in AD compared with controls . In studies using targeted proteomic screening approach, novel biomarkers including C3, CgA, IL-1α, I-309, NrCAM and vascular endothelial growth factor were found to further improve differentiation between AD and non-AD dementia, with altered levels of IL-1α and TECK being associated with subsequent cognitive decline . In addition, oligomeric Aβ species have been implicated in the pathophysiology of AD, and therefore may correlate with the onset of disease. Novel assays of misfolded protein for the detection of soluble Aβ1-40 and Aβ1-42 oligomers in CSF have shown promise in terms of greater accuracy in differentiating patients with MCI and AD from normal controls, as compared with the usual methods based on fibrillar forms of the peptide [15, 78]. While there have been extensive efforts in defining biomarkers of AD-P, the need for biomarkers of other forms of dementia may be even more acute. For instance, we now know that FTD is associated with at least three pathological subtypes due to abnormal protein accumulation from tau, from TAR DNA binding protein-43 (TDP-43), and from the RNA-binding protein Fused in Sarcoma (FUS). However, their clinical presentations are highly variable and heterogeneous, which includes behavioral variant FTD, progressive nonfluent aphasia, and semantic dementia, and can often be confused with logopenic and frontal (behavioral) variants of AD. While a number of studies have demonstrated utility of CSF biomarkers in differentiating AD from FTD variants, few have demonstrated good utility in differentiating between FTD subtypes [52, 79]. Targeted multiplex proteomics screening found that Fas, agouti-related peptide, adrenocorticotropic hormone, and several chemokines (IL-23, IL-17) may have utility in differentiating FTD with TDP-43 accumulation from FTD with tau accumulation . These novel findings require further replication and validation. In the unique case of familial frontotemporal dementia due to progranulin (PGRN) mutations that causes a subset of FTD with TDP-43 accumulation (Mackenzie type 1 or type A) pathology, there is emerging evidence that CSF and plasma levels of progranulin may predict the presence of a mutation. Low plasma progranulin levels predict progranulin mutations in frontotemporal lobar degeneration [21, 80]. It is not yet known whether low PGRN levels will predict individuals with other subtypes of FTD with TDP-43 accumulation, such as in sporadic cases. Vascular cognitive impairment and VaD are conditions that often coexist with AD . While some studies have found utility of Aβ1-42, t-tau and p-tau in differentiating AD from VaD , this has not been consistently replicated. This differentiation may, in part, be due to the co-existence of AD and vascular cognitive impairment/VaD in a given study sample. Several studies have found that the elevation of the CSF/serum albumin index may be a useful measure of disruption to the blood-brain barrier due to VaD [83–86]. Another potential biomarker for VaD is CSF sulfatide, an acidic glycophospholipid presented in myelin sheaths of oligodendrocytes that was found to be 200% higher in VaD patients compared with controls and AD patients [87, 88]. This marker was found to be decreased in a study of MCI and early AD compared with controls, but its exact mechanism in relation to neurodegenerative disease remains unclear . Neurofilament is a cytoskeletal component concentrated in larger myelinated axons. A few studies found that CSF neurofilament elevation is associated with the presence of white matter changes, whereas CSF neurofilament is normal in AD [90–92]. Other markers of inflammation including IL-6 and metalloproteinase-9 are elevated in VaD or its precursor state, but not in AD [92–96]. A caveat of these inflammatory markers is that they may be influenced by other disease states, for instance viral meningitis, and must be interpreted with caution. DLB and PDD are also common causes of cognitive decline in older people. Like vascular cognitive impairment and VaD, DLB can often co-exist with AD in patient populations . Several studies have shown that levels of CSF Aβ1-42 are decreased in DLB and PDD, which is also predictive of future cognitive decline [55, 77, 98, 99]. However, in these studies, subjects were diagnosed clinically without pathological confirmation. It is possible that these patients had mixed AD/DLB, or that DLB pathology per se can cause a drop in CSF Aβ1-42 levels [100–103]. In contrast, while t-tau and p-tau levels in DLB may be similar or slightly lower than those of controls, they are significantly higher in AD compared with DLB, and therefore can be used to differentiate AD from DLB [104, 105]. There is, moreover, emerging evidence that measurement of specific forms of α-synuclein in CSF may contribute to the diagnosis of PDD and DLB. However, studies have been mixed, and further validation is required before this can be put forward as a diagnostic test for PDD or DLB . Several methodological limitations remain before biomarkers can be applied in clinical practice. While the measurements of CSF concentrations of these biomarkers using enzyme-linked immunosorbent assays (for example, Innogenetics, Ghent, Belgium) or multiplex techniques (for example, xMAP; Luminex) have an acceptably low coefficient of intra-laboratory variability (5 to 10%), the high inter-laboratory variation (20 to 30%) hinders comparison of data generated in different settings . Potential sources of variation include pre-analytical conditions (that is, sample handling and aliquot storing), analytical conditions (different methods), and post-analytical norms for patients for defining the cutoff points (that is, age or apolipoprotein 4 status). Furthermore, the current body of knowledge regarding biomarkers fails to categorize clinical scenarios characterized by ambiguous, indeterminate or conflicting results involving multiple biomarkers. In summary, while CSF biomarkers in AD and dementia have made significant advances and hold great promise for future application in the clinical setting, we cannot recommend their general use until the above limitations have been rectified. Working groups have been developing protocols to resolve these issues (see ). Plasma amyloid measurements are not recommended for clinical practice (Grade 1B). CSF biomarkers are not recommended in the diagnosis of AD to evaluate subjects with typical clinical presentation of AD (Grade 2A). CSF biomarkers are not recommended for screening of normal healthy subjects for the purpose of assessing future risk of developing AD (Grade 1B). CSF biomarkers can be considered in special cases in which there are atypical features or diagnostic confusion, such as differentiating frontal variants of AD from FTD, or cases of progressive aphasia, which may be due to AD-P or FTD pathology (Grade 2B). In specialized settings, CSF biomarkers can be considered to improve diagnostic certainty and prognostication in mild cognitive impairment or possible AD; for example, when considering participation in a clinical research study (Grade 1B). If a decision to obtain CSF biomarkers is made, a combination of Aβ1-42, total tau, and/or p-tau measurements should be used (Grade 2A). We recommend that biomarkers analysis must be performed under a standardized protocol at a centralized and certified facility (commercial or academic) with a track record in producing high-quality, consistent data, and interpreted by specialists with expertise on the field of fluid biomarkers (Grade 1B). Pedro Rosa-Neto, Ging-Yuek Robin Hsiung and Mario Masellis contributed equally to this work. Sincere thanks to the staff of Medplan who helped prepare the numerous teleconferences prior to and the logistics of the CCDTD4 meeting, as well as the staff of the McGill Center for Studies in Aging who helped during the meeting in Montreal. PR-N was supported by the Alzheimer's Association new investigator grant, Fonds de la Recherche en Ranté du Québec, Chercheur Burcier award and Canadian Institutes of Health Research (CIHR). MM receives research support from the Parkinson Society Canada, CIHR, Ministry of Economic Development and Innovation of Ontario, Consortium of Canadian Centres for Clinical Cognitive Research (C5R) and Teva Pharmaceuticals, and salary support from the Department of Medicine (Sunnybrook HSC and University of Toronto), and the Sunnybrook Foundation. CCDTD4 participants: A Al Rashed, R Bartha, H Bergman, J Bethell, S Black, C Bocti, M Borrie, A Burham, H Chertkow, C Cook, J Crowson, M Donnely, H Feldman, S Gauthier, M Gordon, G Heckman, N Herrmann, D Hogan, GYR Hsiung, G Inglis, C Jacova, R Laforce, K Lanctot, L Lee, K Leclair, M Masellis, F Massoud, A Moore, C Patterson, S Prasad, K Rabheru, K Rockwood, D Sadovnick, JP Soucy, L Trudeau, I Vedel, M Williams.